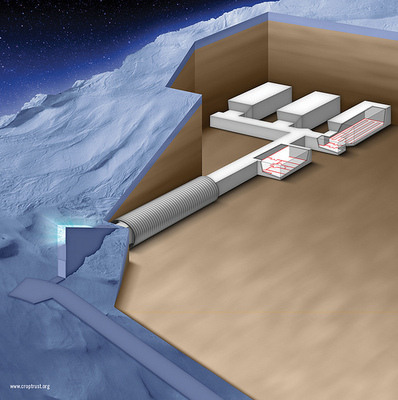 In February 2008, The Svalbard Global Seed Vault was established in the permafrost of the mountains in Svalbard, Norway. A joint venture between the Consultative Group on International Agricultural Research (CGIAR) and conservationist Cary Fowler, the vault is designed to store duplicates of seeds from seed collections around the globe. Many of the seed collections in the vault come from developing countries. If these seeds are lost — as a result of natural disasters, war or simply a lack of resources — the seed collections can be reestablished using seeds from Svalbard. The vault currently holds over 770,000 different seed samples for long term storage, making it the largest seed storage facility in the world. The Svalbard Global Seed Vault also ensures that the genetic diversity of the world’s food crops is preserved for future generations, and is an important contribution toward the reduction of hunger and poverty in developing countries. The greatest plant diversity originates predominately in developing countries, where the need for food security and the further development of agriculture is most urgent. The loss of biological diversity is currently one of the greatest challenges facing the environment and sustainable development. The diversity of food crops is facing increasing pressure – the consequences could include an irreversible loss of the opportunity to grow crops adapted to climate change, new plant diseases and the needs of an expanding population. 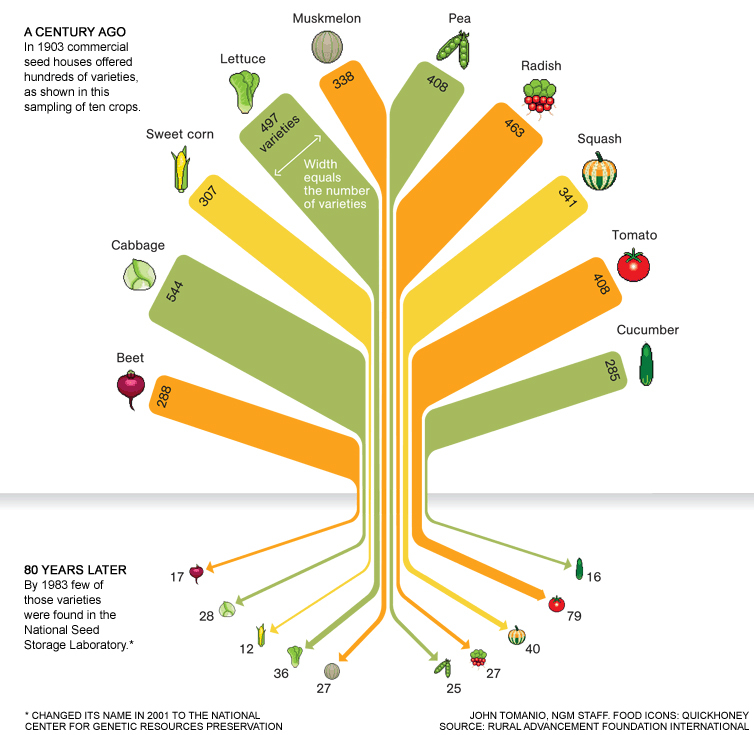 Check out the visual below to see some of the main losses in crop diversity since 1903. Funding of the Vault Construction of the Vault was funded entirely by the Norwegian government. Since no staff are needed permanently on-site, the annual operating costs are as low as around $300,000, and these costs are shared between the Trust and the Norwegian government. If thought of as an annual insurance premium for the world’s food supply, this represents astonishing value. The Trust is also assisting developing countries with preparing, packaging and transporting samples of unique accessions from their genebanks to the Arctic, and the Trust is financing the deposit of samples from the international collections of the Consultative Group on International Agricultural Research (CGIAR). The Role of the Global Crop Diversity Trust The Trust sees the Svalbard Global Seed Vault as an essential element of a rational and secure global system for the conservation of crop diversity – after all, every good system needs a back-up. The Trust supports the conservation of crop diversity in genebanks worldwide. As an extra layer of security, the Svalbard Global Seed Vault stores a backup of these valuable seed collections. The Trust is committed to supporting the ongoing operational costs of the Vault, and is assisting developing countries with preparing, packaging and transporting samples of unique accessions from their genebanks to the Arctic.